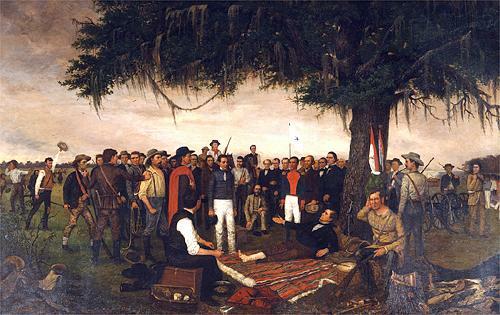 Pictured right ( from our Texas state archives in Austin and depicting the day when the Republic of Texas, known forever after as The Lone Star Republic, became in fact as well as aspiration a Free and Independent nation) --- see the world-famous painting of the American Scotch Irishman General Sam Houston accepting the surrender of the brutal, corrupt and bloody Mexican Dictator Generalismo Santa Anna immediately following the Battle of San Jacinto along the banks of the San Jacinto River at present-day Houston Texas. despotic regimes of Mexico and opened up the western American continent to settlement by the "Third Wave" of American pioneers. other present-day U. S. states. or "six shooter," and one of the most astounding mounted guerrilla fighting forces in military history, the Texas Rangers. From among the Scotch Irish of America came some of the greatest of all American warriors and leaders shaping these incredible events.